There are a number of Supervolcanoes around the world and perhaps the most recent one to erupt was in Italy. The term Supervolcano has been popularized by the BBC and the Discovery Channel story on Yellowstone back in 2005. According to the United States Geological Survey (USGS), a supervolcano is any volcanic center that has explosively erupted at least 1,000 cubic kilometers (240 cubic miles) of fresh volcanic material in a sudden, violent manner – in a so-called supereruption – often producing a huge depression crater named a caldera. Currently, Italy’s Campi Flegrei volcano has been showing signs for the first time in nearly 400 years that it is still alive and well and capable of making a lot of people experience a very bad day. 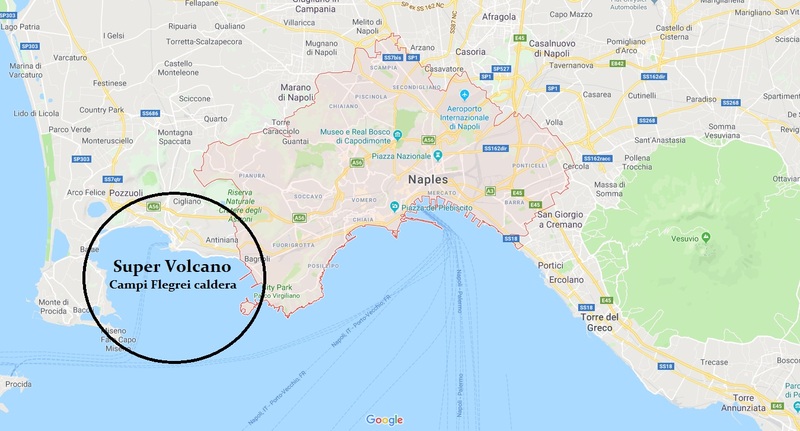 Aside from Yellowstone, the largest volcanic eruption in the Northern hemisphere in the past 100,000 years, has been attributed to a Supervolcano which erupted some 39,400 years ago in what is known as the Phlegraean Fields by Naples, Italy. This has been documented from several sources. The ashes from this eruption were distributed over the entire eastern Mediterranean and up to central Russia. This was a huge event that clearly also produced a Volcanic Winter, and that is what is the worst thing for the rest of the world who resides at a safe distance from the actual Supervolcano. We are beginning to witness a rise in volcanic activity as we enter solar minimum. Hopefully, we are not facing a catastrophic volcanic winter period. But it also does raise some concern about a pole shift can be far more rapid than previously anticipated. I believe that people prefer to assume uniformity rather than a catastrophe. A stalagmite-based paleomagnetic record of the post-Blake excursion reveals details of repeated polarity drifts have occurred during periods of low geomagnetic field intensity at 100 thousand years before present around the time of this Naples eruption. One surprisingly abrupt centennial reversal transition occurred in 144,000 provides unprecedented evidence that raises fundamental questions about the speed of geomagnetic field shifts. Such rapid polarity changes could severely affect satellites and human society in the future if the current geomagnetic field intensity continues to decrease. We have a pole shift, climate change, and volcanic eruptions seem to be interlinked on a correlated basis. Our correlation models have warned that this is something that needs to be investigated. For the first time, laying out this record produces what appears to be a single geological archive creating a precise chronological order. These types of events can take place in the space of even just a single decade. The recent events at the Campi Flegrei volcano have, for the first time in nearly 400 years, provided a warning sign. The ground at the center of the caldera has bulged up by 4 meters warning that lava is collecting once again. This uplifting curiously began in 1985 with this ECM wave. Keep in mind that the eruptions at the Supervolcanic level took place around 315,000, 205,000, 157,000 and 18,000 years ago. A minor event is still at the level of Vesuvius. So while we no doubt face a major Supervolcanic event, that level may still be off several thousands years into the future. What is emerging now is more likely to be an important event, but not at the Supervolcanic level.